A graphic from the Hindustan Times, one of many with inaccuracies. Some experts who care about and practice visual news have sharp complaints about the non-factual graphics that were so widespread in the media’s coverage of the death of Osama bin Laden on May 1. Journalism is a serious business where credibility is paramount. Editors need, first and foremost, to get the facts right, in graphics as well as text and video. What happened last week was that some editors, given a sensational story and little detail, acted as if they were in show business, not the news business. Graphics often were flashy and hyped and very inventive – good show business – but if they portrayed what actually happened, it was only by accident. In this article, we offer six rules to ensure that editors follow basic, ethical journalism standards in presentation of infographics. It’s a statement in the form of a checklist. Fifty-eight journalists, all of them highly regarded in the field, have endorsed the statement. Their names are listed at the end of the checklist, and we expect that more will sign on in the coming days. As we can see here (Brazil), here (UK), here (India), and here (U.S.), some publications presented as facts what was just fiction. Sometimes there was no factual support whatsoever. It’s as though William Randolph Hearst was back with us, saying once again, "You furnish the pictures and I'll furnish the war." This kind of thing has happened before, so the misuse of infographics was not totally unexpected. One ostensible excuse was that the Obama White House frequently changed the story of the raid, presenting conflicting pictures day by day. In this non-stop, 24/7 news world, editors need to practice restraint and not rush with images when the facts are not there. 5. Information graphics professionals should refuse to produce any visual presentation that includes imaginary components designed to make it more "appealing" or "spectacular". Editors must refrain from asking for graphics that don't stick to available evidence. 6. Infographics are neither illustrations nor "art". Infographics are visual journalism and must be governed by the same ethical standards that apply to other areas of the profession. John Grimwade (USA), graphics director at Conde Nast Publications. Mario Tascón (Spain), former El Mundo infographics editor. Nigel Holmes (USA), former graphics director, Time magazine. Carlos Soria (Spain), chairman of Innovation. Unar Vegstein (Norway), Afterposten's head of design. Mark Porter (UK), Principal, Mark Porter Associates. Javier Zarracina (USA), Boston Globe's graphic editor. Adrian Norris (Canada), managing editor, design and presentation, Globe and Mail. Jaime Serra (Spain), La Vanguardia's infographic and illustration editor. Corrie Parsonson (UK), Context Graphics Limited's managing editor. Carmen Riera (Venezuela), graphic editor, Cadena Capriles. Fernando Baptista (USA), senior graphics editor, National Geographic magazine. Francesco Franchi (Italy), IL-Intelligence in lifestyle, Il Sole 24 ORE's art Director. Andrew Jaspan (Australia), former editor, The Age. Alvaro Valiño (Spain), Público's infographics director. Linda Eckstein (USA), former Information graphics editor, Fortune. Antonio Martin (Spain), senior desisn consultant, Innovation. Tonia Cowan (Canada), Globe and Mail's graphics editor. Charles Apple (USA), editor, The Visual Side of Journalism's blog. Chiqui Esteban (Spain), Lainformacion.com new narratives editor. Jan Schwochow (Germany), In Graphics, graphics executive creative director. Henrique Monteiro (Portugal), former editor of Expresso. Emilio Deheza (Mexico), formerly Reforma's graphic director. Adonis Durado (Oman), design and graphics director, Al Shabiba. Juantxo Cruz (Spain), El Mundo's infographics editor. Luis Chumpitaz (UAE), information graphic director, Al Bayan. Jonas Dagson (Sweden), infographics editor, Swedish Graphics Agency. Oscar Santiago Méndez (Mexico), design director, El Universal. Michael Stoll (Germany) professor of information design, Augsburg University. Pablo Loscri (Argentina), infograhics director, Clarin. Miguel Angel Gomez (UAE), design director, Gulf News. Nick Mrozowski (USA), creative director, Adweek magazine. Pedro Monteiro (Portugal), digital art coordinator, Impresa Publishing. Douglas Okasaki (UAE), senior designer Gulf News, and Society for News Design regional director, Middle East and Africa. Nils Kr. Reppen (Norway), news graphics journalist. Michael Robinson (UK), head of graphics, The Guardian and The Observer. Bertrand Pecquerie (France), CEO of the Global Editors Network. Jeff Goertzen (USA), infographics editor, The Denver Post. Svenåke Boström (Sweden), former president, Society of News Design. Alberto Cuadra (USA), graphics editor, The Washington Post. Grzegorz Piechota (Poland), special projects editor, Gazeta Wyborcza. Pablo Ramírez (Spain), founder of Sinpalabras. Miran Pavic (Croatia), editor, Nedjeljni Jutarnji. Velislava Popova (Bulgaria) editor-in-chief, Dnevnik. Roger Black (USA), founder, Roger Black studio. Fabio Sales (Brazil), art director, O Estado de S. Paulo. Walter Bernard (USA), former art director, Time magazine. Paul Blickle (Germany), art director, In Graphics. Spiros Polikandriotis (Greece), senior design consultant, Innovation. Rich Beckman (USA), Knight chair in visual journalism, University of Miami. Max Gadney (UK), curator, Design of Understanding conference. Guillermo Nagore (USA), creative director, SYPartners. Norvall Skreien (Norway), former president, Society of News Design/Scandinavia. André Gunthert (France), director of the Laboratoire d'histoire visuelle contemporaine at the Ecole des hautes études en sciences sociales. Gert K.Nielsen (Denmark), editor, VisualJournalism blog. Rosental Calmon Alves (US), Knight Chair in Journalism, University of Texas at Austin. Eduardo Asta (Brazil), Infographics editor at Estado de S. Paulo. Simon Ducroquet (Brazil), Infographics editor at Folha de São Paulo. Ricardo Santos (Portugal), infographics editor, i-newspaper. Tom Corbett (Belgium), International Newsmedia Marketing Association, European Office. Carlos Guyot (Argentina), innovation director, La Nación. David Michelsohn (Brazil), multimedia editor, Epoca. Robb Montgomery (USA), CEO, Visual Editors.? Ricardo Jorge de Lucena Lucas (Brazil), journalism professor, Universidade Federal do Ceará. Alfonso Everlet (Spain), owner of 3Planos.com. Daniel Cedeño Urbina (Venezuela), president, Excellentias.com. Nigel Hawtin (UK), graphics editor, New Scientist. Monica Ulmanu (USA), graphics journalist, Boston Globe.? Vasco Ferreira (Portugal), art director, Impresa. Miguel Angel Carbonero (Spain), infographics editor, Diario de Mallorca. Geoff McGhee (USA), creative director, Bill Lane Center for the American West, Stanford University. Víctor Caballero (Spain), Visual Journalist, Vectart. Teo Jansen (Venezuela), sports editor, Diario Primicia.? Ivan Kemp (Portugal), infographics editor, Sabado. Joe Sharpe (UK), creative director and partner, Applied Works. German Pizarro (Spain) infographics director, Marca. Wm Pitzer (USA) news graphics editor – The Charlotte Observer. Lee McGorie (UAE), assistant art director, The National.? Hans-Jürgen Polster (Germany), art director, Berliner Morgenpost. Jerry Luciani (USA), AME/graphics & design, The Record, NJ. Adriano Attus (Italy), deputy art director, Il Sole 24 Ore.
Remy Jon-Ming (Netherlands) infographic designer FD.nl. Gerson Mora (Brazil), infographics designer, Epoca.? Ninian Carter (UK), freelance infographic artist Globe And Mail. Xan Sabaris (China), infographics editor, China Daily. Jonathan Stray (USA), interactive technology editor, Associated Press. Bjorn Hellstrom (Sweden), director of infographics, Sydsvenska Dagbladet. Juan Colombato (Argentina), infographics editor, La Voz del Interior.? Jay Carr (USA), graphics director, Houston Chronicle. Daniel Garcia (Spain), Lecturer at the University of the Basque Country. Anibal Maiz (Mexico) Web design & infographics editor, Mexico City. Manuel Romero (Spain), creative director, Servicio Telegráfico. Rodrigo Fino (Argentina), designer, Mario Garcia-Media.? Steve Dorsey (USA), president, Society of News Design (SND). Nicole MacAdam (Canada), presentation editor, News & Sports, Globe and Mail. Chuck Todd (USA), presentation editor, Bay Area News Group - East Bay. Valentina Alvarez (Argentina), visual communicator. Andrés Escobar (Chile), journalist, Emol.com ? Ciprian Rus (Romania), editorial & project manager, Puntomedia. Gustavo R. Torres (Mexico), former design editor, El Siglo de Torreon. Andy Kirk (UK), editor Visualisingdata.com. Rodrigo Cunha (Brazil), infographics artist, Época. Alfonso Díaz Knörr (Spain), design editor, Diario de Burgo. Peter Ong (Australia), principal consultant, Checkout. Andreia Caires (Brazil) infographics editor, Veja/Veja.com. Additonal endorsements and comments are of course welcomed. Where appropriate, please include your name, country and position. Supporting the cause and upholding journalistic values for informational graphics. Endorsing higher standards in information design and a six-point checklist to insure such standards are met. The authors make some very good points, but repeating Hearst's alleged comment, "You furnish the pictures and I'll furnish the war" may not be the best way to support a call for accuracy. In his excellent book "Getting it Wrong" (University of California Press: 2010) W. Joseph Campbell makes a good case that Hearst probably never said it. I endorse! I will also take the opportunityand use this post to spread some light over the basics of infographics to my colleagues. In a few hours we will add your names to the list. And please spread the word in your newsrooms. It is very important to educate especially in small newspapers. Couldn't agree more. I endorse and congratulations for the idea. Fully endorse! Congratulations for the idea. The rush to understand something and make it clear to readers in a news graphic should not cloud our news judgement or our journalism ethics. These are a great set of guidelines to apply to infographics and I fully endorse. I a perfect world i agree with it all, but the six rules leaves us with several problem under the circumstances we are working. Who can tell wich way the black hawk went down? Who can tell if Bin Laden were alone in the room? And wich room? Should it prevent us from visualise it and tell the story? In eager to be perfect and tell the 'truth' by following these six rules in the category breaking news, we might end up with very few graphics, or even worse...nothing. Yup, I can get behind these. Totally agree with the rules. Again, it's the content, not the "drawing". I rather see less but reliable graphics than a bunch of icons that may mislead me. People trust in newspapers because they offer reality, not tales. Let's not confuse "creativity to make a better newspaper" with "imagination to fill the pages". The rules look robut on initial viewing, but even if they turn out to be requiring iteration it is great to see this sort of debate being openly and constructively pursued by all involved. A healthier practice will be the result of all this. I couldn't have said it any better than Juan and Alberto, and I thank them for this timely and important reminder. An International Statement on Infographics and Visual Journalism. Ciudadano Kane, Osama bin Laden y la infografía de prensa. Expertos de 22 países firman un manifiesto contra gráficos sensacionalistas en prensa a raíz de la muerte de Bin Laden. Totally agree with the rules. Fully endorse. I am in full agreement. Some of this material was discussed with my journalism students and they could see the amount of error (some silly) in making this material. Completely agreed. I´m sure that´ll be a great step for the visual journalism. In contemporary Journalism, the aspect of infographics naturaly have to follow the canon: reporting it's art and craft. Nieman Watchdog report pushes for ethics in infographics. 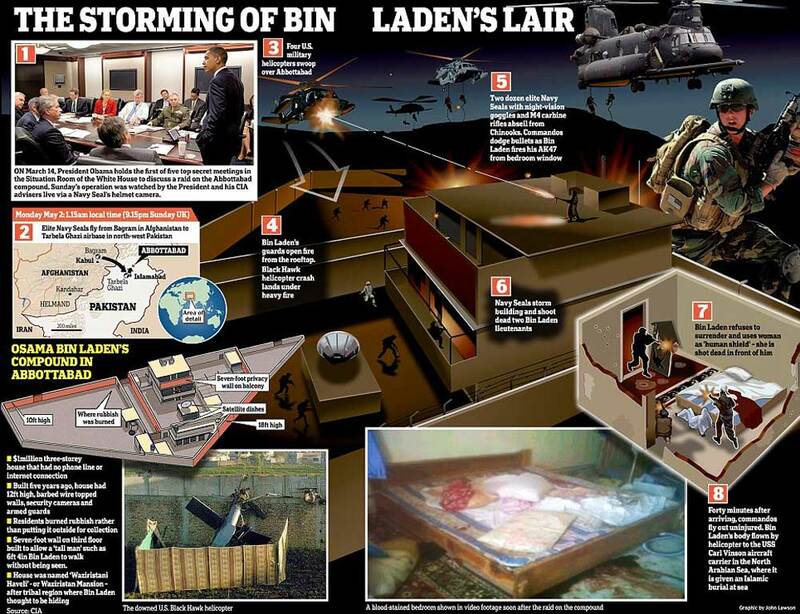 Editors, artists chafe at the errors and hype in bin Laden death story graphics. A growing call for higher standards in infographics. Agree totally, We need good training and clear career paths before views of info-artists are valued/respected within editorial hierarchy. I think a list of rules/guidelines is a great and needed start to achieve accuracy in news graphics. Most news artists, including me, have the best intentions when it comes to ethical reporting and accuracy in our work, yet certainly there are some out there who ignore these two cornerstones of journalism. In my experience, breaking news graphics fall somewhere on a spectrum ranging from cartoony inventions with little or no basis in fact to extremely accurate and straightforward representations of the facts as handed out by reliable sources. For a variety of reasons, many infographics can fall somewhere in between, left or right of center. Where things can go badly with a graphic, despite the best of intentions, is when visual journalists include information that is based on unconfirmed sources that later turn out to be wrong. Some of my work has certainly fallen into this category. I never invented information, but occasionally I got it terribly wrong because I trusted a source of my own, beyond the official ones. At other times, though, such reporting reaped huge exclusives for my publication. Journalism is, after all, about getting and reporting facts, not just presenting what is spoon fed to us. But in the case of a story that happens so far away, as with Osama, our hands can be pretty much tied to what we're being fed. Are real crime, though, is when we crash a helicopter (any helicopter) somewhere in the graphic (anywhere in the graphic) just because we know that one crashed and we have to put it somewhere. Of course it will be wrong, and this approach to displaying hazy information diminishes the credibility of the rest of the graphic, and worse, our publication, because it lies to the reader. Most breaking news graphics are made under a tight deadline and most visual journalists must (1) get it right and (2) beat the competition, two demands that work against each other. But with good, accurate reporting one can achieve both. El periodismo visual sufre el mismo retroceso ético que el periodismo escrito. Right said. I fully endorse that manifesto. It wil help a lot making sure graphics guys work as journalists, committed with the communities their medias serve and the professional standards of the trade. There are still so many of them still considering themselves as illustrators, designers or the like… and it shows. And, yes, it will also help a lot if journalists "by career" stop treating the graphics guys as illustrators, designers or page-decorators instead of journalists on their own right. Great initiative, JAG and Alberto! Completely agreed. It seams we need to learn to stop a few feet before the unknowledge red line. This is a good idea except for one overriding element. The mainstream media is no longer a trusted source of information. And it is losing readers and viewers in the millions daily. Why? Because there is no independent reporting. It is remarkably easy to prove. Choose a topic, any topic the mainstream doesn't want to cover (9/11, Kennedy, UFOs, global warming skeptics, etc.) Google the topic and watch the list of personal blogs and foreign news sources that report it. Internet is great. It shows us daily who is in bed with who in the journalism biz! If this initiative was to really work - it would have to accompany a real journalistic piece on how Osama disappeared back in 2001. And how without a body - the world speculates Osama lives on. And how mainstream media has dug itself a grave and now lies... in it daily. This may be part of my final college paperwork about infographics. Probably will. The checklist should have a #7 which specifically addresses DATA graphics quality. There are still way too many misleading data graphs. For example, percentage graphs of rates (percentages) are too frequently misleading when compared with the real numbers used to calculate the percentage data. Designs are often changed when the real numbers are considered. In general, there needs to be a grammar of info graphics just like there is for language. That should take care of many design issues and poor practices. How many new graphic artists are able to say to an editor that his idea/suggestion/request for a graphic won't work at best or is just plain speculation at worst? We need the code listed above to become part of all journalists training. The problem becomes worse when we look to the huge numbers of so-called "infographics" which are used as "content" on the internet - containing carefully selected statistics provided by the companies and vested interest groups to make their argument.